Town Šaľa is situated in the northern part of the Podunajská lowland on both banks of the Váh river. Town is mentioned in historical text books because of find of a neanderthal skull, 45-60 thousand years old. The first written record of this seat dates back to 1002 under the name Terra Wag. This area had belonged to Ponanhalm Abbey. The King Ferdinand I awarded Šaľa town privileges in 1536. 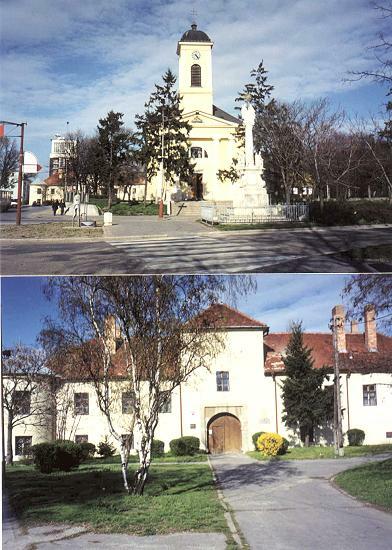 In 1598 a Jesuit college was built up and was well-known in whole Hungary. The most important monument in the city is the Rennaisance Monastery, the former water castle. Nowadays it is the seat of the state district archive. In the centre of city visitors will see Holy Trinity Square with a sculpture of Holy Trinity, the Roman-Catholic Church of St Margita, a hotel and buildings of the Municipal and District Office. A very fine atmosphere of the centre forms the pedestrian zone. A wide range of shops and a lot of other facilities offer their services to visitors and domestic people. There have their seats many administrative, judicial, school, health and cultural establishments. Seven elementary schools, School of arts, a secondary school, special schools (technical, skilled) - SPŠ, SPŠCH, SOUCH, SOUP are located here. And Šaľa is a town with many important companies and developing industry and agriculture, developing tertiary sector and a sports-recreational base. To this resort belong a sports hall, a bowling hall, tennis courts, a swimming pool, an area of water sports at the Kráľová Dam, an indoor swimming pool, a fitness centre, saunas, football playgrounds and an ice rink. Horseback riding is being developed at the SOUP school. Floodplain forests of the Váh meanders are a paradise for fishermen and hunters. Navigability of lower flow of the Váh is an assumption for river´s exploiting not only for recreational, but also for transport purposes. Town offers very favourable conditions for culture provided by the Cultural House and the Social House in Šaľa-Veča, two cinemas, a theatrical and variety hall, a marionette hall, a summer cinema. There are organized the Pan-Slovak events Šaliansky Maťko and Zlatá priadka. The cultural-social organization arranges the theatrical festival Šaľaniny every year which is very popular.